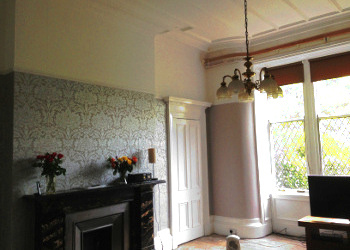 Your Expert Painters and Decorators in Glasgow West End. Here you'll find examples of our high quality painting and decorating work along with our contact details. 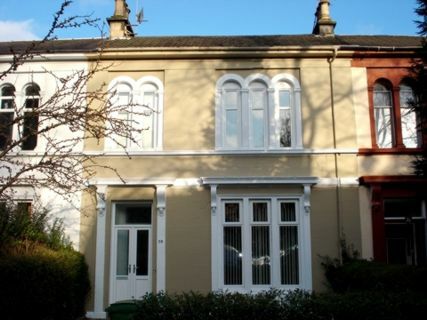 We undertake both internal and external painting, plastering and tiling with a specalisation in sash window painting and refurbishment that includes full painting of casements and sashes, draftproofing and restoration. 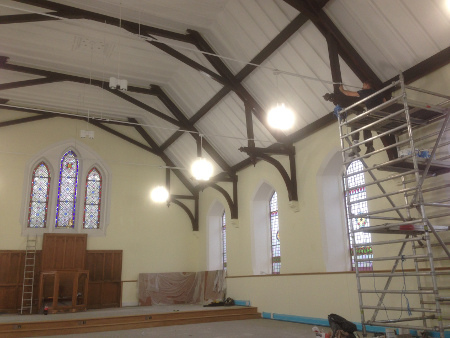 ADM Painters Decorators Glasgow. 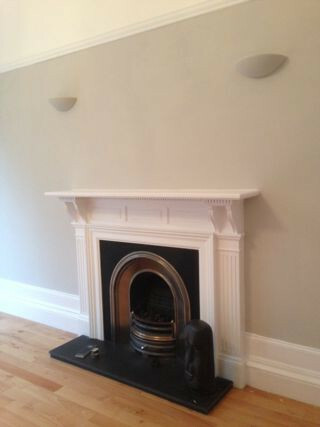 Expert Painters and Decorators in Glasgow West End. We provide a wide range of interior & exterior domestic painting and decorating solutions and are proud to have many repeat customers and customer recommendations. Thinking of wall paper? We provide an expert paper and fabric hanging service, for Farrow & Ball, Timours Beastie, Muraspec, Osbourne & Little, Altfield etc. 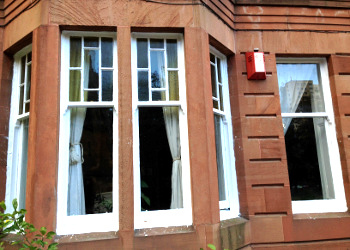 Sash Window Refurbishment is our speciality. 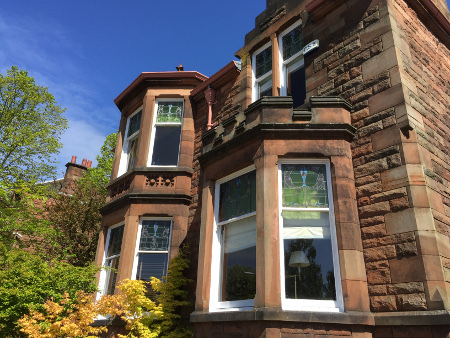 We provide expert Sash Window Painting, Draft proofing and Full Sash Window Maintianince Services in Glasgow and Edinburgh. Decoritve Cornice repair & modling to new lathe & plaster ceilings. 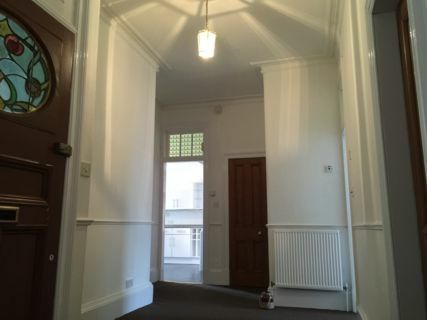 We are highly skilled specalist plasterers accustomed to working in prestage west end properties. 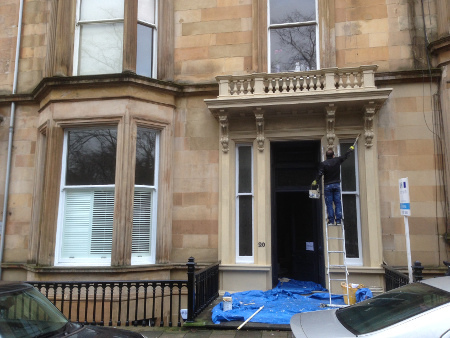 Internally prepared and painting of 18 rooms of prestigoius 3 level town house in West End of Glasgow. Externally, preperation and painting of 21 Sash Windows, Iron Railings, Main entranceway and surrounds including ornate balastrtades. 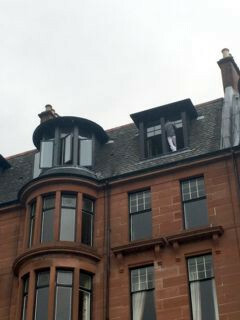 Restoration and Painting of 27 Sash Windows of large detatched villia including sill repairs. What do we do at ADM Painters Decorators Glasgow? 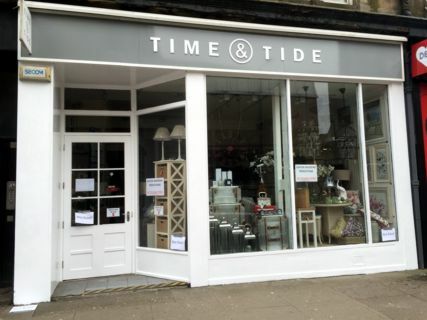 We are a reputable and respected painting company with over 25 years experience in the industry mainly operating in Glasgow West End and offer fantastic value for money to all our customers with high-end workmanship at fantastic prices. 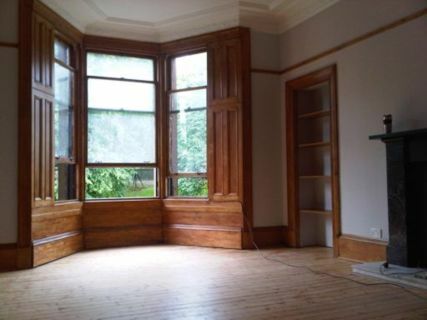 We pride ourselves in providing the highest quality, competitively priced painting and decorating, delivered professionally, from start to finish throughout Glasgow and the West End of Glasgow. We offer a full range of domestic and commercial painting and decorating solutions and are sash window painting specialists. 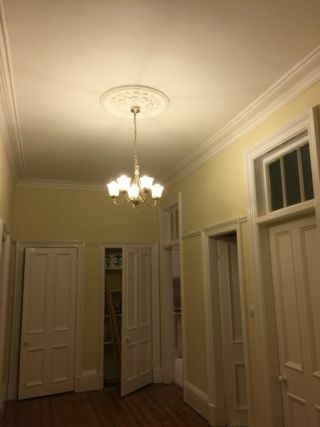 Though we are a painting and decorating company based in Glasgow West End, our high quality services are available throughout central Scotland. Our highly experienced team deliver excellent service throughout Glasgow and surrounding areas. We never lose sight of customer satisfaction and we really do believe this is what makes us different. Click or double tap depending on your device to see larger pictures of our work. "Excellent work, clean tidy and very professional"
"Did a fantastic job of the windows, Thank you! Outstanding work! Great team, really impressed with the whole service. You can rely on us for a responsive, professional and friendly painting and decorating service. An expert painting and decorating solution to your home improvement or business needs is only a click or a call away, so contact us today. Looking for a painting and decorating Job? If you have the motivation and skills then call today. Alternatively request a call-back at a convenient time by completing the contact from.